This morning, my iPhone lit up with a news alert that totally grabbed my attention. That it came from Fox News is an afterthought; it was all about the message therein. Unlike most push alerts – where reading that condensed message qualifies as “understanding” the story – this one warranted a click, primarily because I – like many of you, apparently – just don’t buy it. And boy am I happy I did! A push alert from Fox News, Thursday, May 11, 2017. Let’s grab some popcorn and examine a quartet of excerpts from the 500-word piece, shall we? “Nice,” to a man, means being soft, gentle and kind. It means asking your husband how his day was and really listening. It means doing something nice for him with no expectation of getting something in return. A lot of women think they’re nice because they act nice. But acting nice and being nice are two different things. Being nice means you think of others before you think about yourself. Don’t women want the same thing? 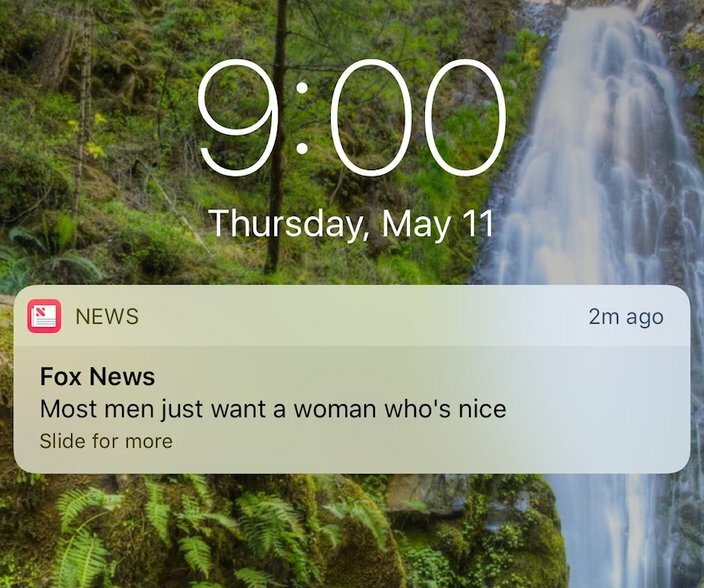 A man who’s nice? Not exactly. Most women do want a man who’s kind, but that’s not the same as nice. Ask any guy you know, and he’ll likely give you example after example of women they know who said they wanted a nice guy but in reality wanted a bad boy. Most husbands have no desire to lord over their wives, but they don’t want to fight with them either. All they want is peace. And the nicer you are, the more likely they are to find it. There’s a lot to unpack there, aspiring nice ladies and their bad boys. Maybe there’s a gaggle of ladies out there that need this sort of casual reminder that their man’s the king of the castle and you should make sure they know that each and every day. But I suspect there’s a whole lot of females out there who have a more valid interpretation of Venker’s lecture than I ever could. So, help me out here: Give the screed a read and then let me know whether you think Venker’s right, or if this going to become yet another totem in the gender wars of America?